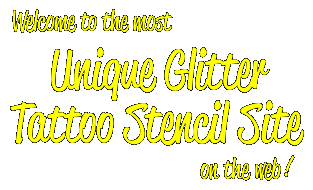 Welcome to the most Unique Glitter Tattoo Stencil site on the web! to purchase some of my unique & out of the ordinary glitter tattoo stencils. 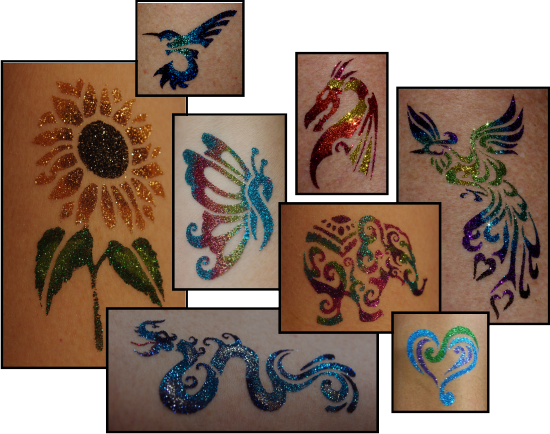 Custom Glitter Tattoo Designs and orders are my Speciality! My stencils are the 3-layer adhesive backed vinyl stencils for glitter tattoos. I make all of the stencils myself, right here in the USA. They are a collection of my designs, old favorites and special requests. and you may purchase as few as ONE stencil. I may have your design and it's just not uploaded to my website yet! If I don't carry it, send me an image and I'll be glad to custom make some for you! I have set up shipping charges for Canada ONLY. Paypal invoice for your shipping charges. Shipping charges are based on weight. so you will only be charged what I pay at the Post Office.